This nice apartement is located in a central area in Marseille, close to the Vieux Port, and the train station. The renovation and decoration of this one bedroom furnished apartment offers comfort and cosiness. The kitchen opens on a small patio, the bedroom is cosy and convenient with storages. 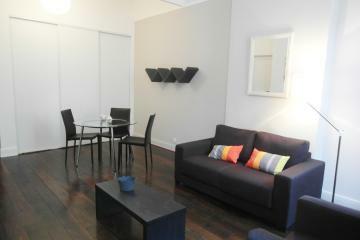 Short term and long term rentals are possible in this apartment, for business or students stays. 0.5 rd floor, without Lift, 1 bedroom Appartement, furnished, Approx: 46m² / 495 Sq.Ft.